Submitted by Mike Penn on 24 December 2018. It is Christmas morning here in Antarctica, but right now, it is Christmas Eve back home. My family has just come home from church and they are all in the kitchen. There is a big spread of food on the island. There is "Christmas Cheese", smoked salmon, pepperoni, crackers, and eggnog. In the next room, there is a beautiful tree that was trimmed just a few days ago. The tree is decorated with hundreds of ornaments, each of which represents a special moment or meaning in the life of the Penn family. There is a puzzle on a nearby table that the family has been collectively piecing together for the past week. In the living room, there is a fire in the fireplace with a stocking for each member of the family hanging on the mantle. The "children" (none of them are kids anymore!) will soon be opening their traditional Penn family Christmas Eve gift of new flannel pajamas! Hugs and heartfelt "I love you's" and "Merry Christmas's" will be said as everyone goes off to bed...Christmas at the Penn house is pretty awesome. While I'm not home with my family celebrating Christmas, I am here in Antarctica with my AWS family! Christmas is definitely different here. We are all almost 10,000 miles from home and none of us is even able to easily communicate with our loved ones at home. But we are here together and together we make up a big Antarctic family. 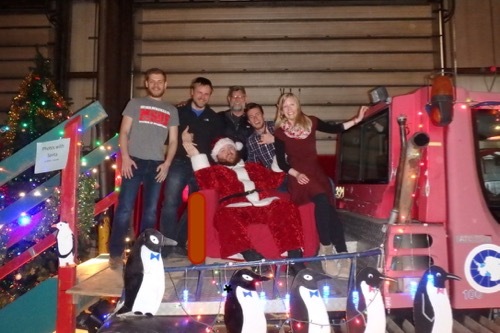 There was a Christmas party in the Heavy Vehicle Maintenance facility where nearly everyone on-station was able to celebrate Christmas with their Antarctic family. Last night there was a big, station-wide party held in the "Heavy Maintenance Facility." Santa was there and we were able to get our picture taken with him! There was a DJ and dancing and in another room, there was live music. No, seriously, we had a GREAT dinner! 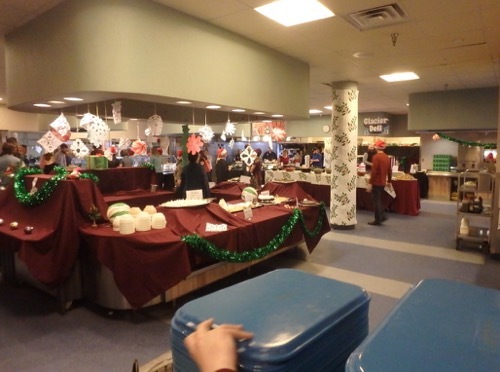 The entire galley was festively decorated for Christmas and there were even tablecloths on the tables! Even though we are far from home and family, we all enjoyed a nice dinner. 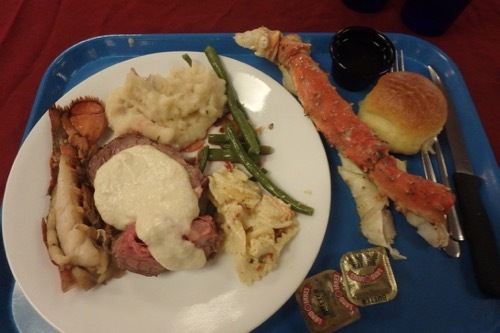 The menu included crab legs, lobster tails, and prime rib! 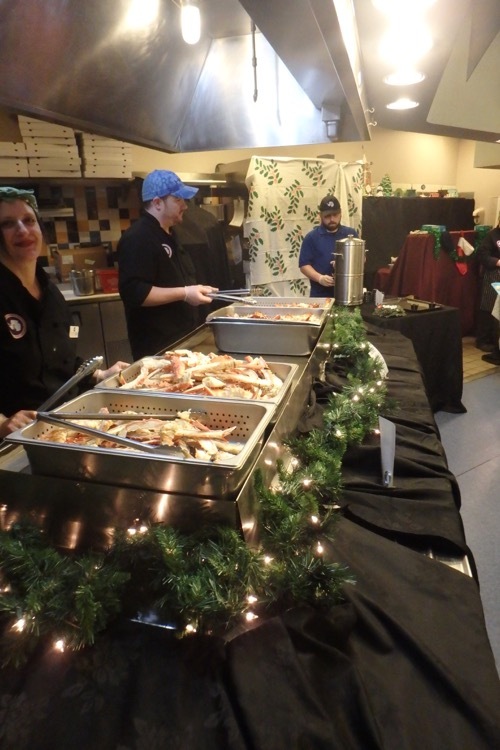 Lobster, crab, and prime rib were on the menu for Christmas in Antarctica. A great meal helps ease missing the holidays with our families back home. There were too many desserts to choose from! The five of us on the AWS team sat with a few other scientists and had a nice leisurely dinner. Each of us talked about home and the Christmas traditions of our families. About half-way through dinner, someone on the other side of the Galley started cheering. We all looked in that direction and at just the same moment we all collectively realized that it was snowing and the whole Galley cheered. Then there was a collective laugh about how silly it is to be happy that it is snowing in Antarctica! The odds were 100% that we would have a "White Christmas" because we are in Antarctica after all! But none the less, it added to the festive Christmas atmosphere. While the chances of a "White Christmas" were 100%, we were all happy to see it snowing during our Christmas dinner here in Antarctica! Though I miss my family very much and I am a bit homesick on this Christmas morning, I am honored to be part of the AWS team and "Antarctican" family. Did you spend Christmas at South Pole Station, or are you back at McMurdo now? I’m glad to see that Santa made it all the way down to Antarctica! Gary, We made it back to McMurdo! Yes, Santa was here! I was really surprised to see him! Guest, Thank you for the check-in. I'm home safe and sound but my team is all still hard at work. 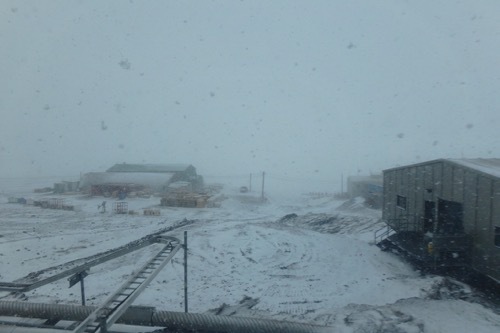 Dave and Elina are at a camp called WAIS (West Antarctic Ice Sheet) and Lee and Forbes are working out of McMurdo!